It follows two horses’ journey into World War I. 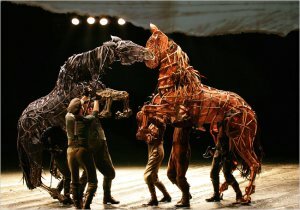 The horses are incredible puppets, designed to look life like to the point where the horses appear to breath. This requires the puppetry of three people, two inside and one outside each horse. Reviews of the production say the story is emotional and interesting, and the puppets are spectular to watch.